Parents: General der Infanterie a.D. Friedrich-Karl and Clemence (née Herwarth von Bittenfeld) von Loßberg. General von Loßberg last served as the Commander-in-Chief of Group Command 1 before retiring from the Army on 1 October 1926. He greatly distinguished himself during World War I receiving the Prussian Pour le Mérite Order (21 September 1916) with Oakleaves (24 April 1917) while serving as the Chief of the General Staff of the 2nd Army and, later, the 6th Army on the Western Front. Wife: Married Ella Schmidt (born 12 January 1909) on 15 July 1934 in Berlin – two sons. A gifted staff officer of physically imposing size with a penchant for playing bridge, Generalmajor Bernhard von Loßberg played an important role planning Germany’s early campaigns as a member of the Armed Forces Operations Staff. Shortly after Hitler dismissed Generalfeldmarschall Walther von Brauchitsch from his post as Commander-in-Chief of the Army in December 1941, von Loßberg likewise incurred the Führer’s wrath. Incensed at his critical attitude regarding the command and control setup of the Armed Forces High Command, Hitler demanded the removal of von Loßberg from his headquarters staff. Despite his obvious operational talents, Generalmajor von Loßberg served out the rest of the war in a series of backwater posts. October 1906-Easter 1908: Attended Vorschule (Preschool) in Hannover. Easter 1908-1910: Attended Gymnasium (High School) in Charlottenburg. Easter 1910-Easter 1912: Attended the Conradinum Gymnasium in Danzig. Easter 1912-Easter 1913: Attended Gymnasium in Eisenach. Easter 1913-Easter 1916: Attended Gymnasium in Stuttgart. 19 July 1916: Entered the Army as a Fahnenjunker in the Replacement Battalion of the 2. Garde-Regiment zu Fuß. 19 July 1917: In the field with the 2nd Guard Regiment of Foot. 15 December 1917-11 January 1918: Transferred to the Replacement Battalion of the 2nd Guard Regiment of Foot. 12 January 1918: In the field with the 2nd Guard Regiment of Foot. 28 March 1918: Wounded/treated at the front and remained with the troops. 29 August 1918: Transferred to the staff of the General Quartermaster. 1 July 1919: Transferred to Reichswehr Infantry Regiment 30 of Reichswehr-Brigade 15. 12 December 1919: Transferred to Reichswehr Infantry Regiment 115 of Reichswehr-Brigade 15 with effect from 1 October 1919. 1 October 1920: Transferred to the 5th (Prussian) Infantry Regiment upon the formation of the new Reichsheer from the Übergangsheer or Transitional Army. 1 November 1923: Leader of the Signals Platoon of the II. Battalion of the 5th (Prussian) Infantry Regiment. 16 February 1925-21 March 1925: Detached to a signals course with the 2nd (Prussian) Signals Battalion. 1 February 1926: Adjutant of the II. Battalion of the 5th (Prussian) Infantry Regiment. 3 October 1927-15 February 1928: Detached to the VI. Officers Weapons School Course at Dresden. 1 March 1929: Transferred to the staff of the Commandant of Berlin. 1 October 1930: Transferred to the staff of Group Command 1 and detached to the staff of the 3rd Division, Berlin. 1 October 1932: Transferred to the staff of Group Command 2 and detached to the staff of the Commandant of Berlin – duties determined by the Chief of the Troop Office. 6 October 1936: Chief of the 14th Company of Infantry Regiment 44 of the 11th Infantry Division. 1 July 1937: Transferred to the General Staff of the I Army Corps and appointed Chief Supply Officer (Ib). 1 November 1937: At the disposal of the Commander-in-Chief of the Army (Special Staff Officer) – duties determined by the Chief of the Army General Staff. 1 April 1938: Transferred into the 4th Department of the Army General Staff. 27 August 1938-20 September 1938: Service in the Spanish War Zone (traveled back and forth by air between Milan, Italy and Palma on the Spanish island of Mallorca). 10 November 1938: Placed at the disposal of the Commander-in-Chief of the Army (Special Staff Officer) – duties determined by the Chief of the Armed Forces High Command (Special Staff “W”). 2 January 1942: Detached to the General Staff of the Army High Command Norway (Generaloberst Nikolaus von Falkenhorst). 5 May 1944: Army High Command Leader Reserve – duties determined by the Army Personnel Office (P 3). 15 June 1944: Chief of the General Staff of the Special Representative for the Danube River (Generaladmiral Wilhelm Marschall). 1 November 1944: Army High Command Leader Reserve – duties determined by the Chief of the Army Personnel Office (P 1). 10 March 1945-8 May 1945: Army High Command Leader Reserve. 1949: Published Im Wehrmachtführungsstab: Bericht eines Generalstabsoffiziers (In the Armed Forces Operations Staff: Report of a General Staff Officer). Prussian Iron Cross, 1st Class (1914): 16 April 1918. Prussian Iron Cross, 2nd Class (1914) 21 September 1917. Cross of Honor for Combatants 1914-1918: 5 December 1934. German Spanish Cross in Silver without Swords: 6 June 1939. Spanish White Military Merit Cross, 3rd Class (La Cruz Blanca del Mérito Militar de 3a clase): 12 April 1939. Finnish Order of the Cross of Liberty, 1st Class with Swords: 25 March 1942. 21-28 July 1917: Pursuit action in Eastern Galicia. 29 July 1917-9 August 1917: Positional combat on the Sereth River. 1-5 September 1917: Battle of Riga. 6-13 September 1917: Positional combat north of the Düna River (wounded). 21-22 March 1918: Breakthrough battle at St. Quentin—La Fère. 23-24 March 1918: Combat at the crossing over the Somme and the Crozat Canal between St. Christ and Tergnier. 25-31 March 1918: Pursuit action to Montdidier—Noyon. 7 April 1918: Combat on the Avre and at Montdidier—Noyon (wounded). Bender, Roger James. Uniforms, Organization and History Legion Condor. R. James Bender Publishing, San Jose, California, 1992 (1st Edition). Knappe, Siegfried with Brusaw, Ted. Soldat: Reflections of a German Soldier, 1936-1949. Dell Publishing, New York, New York, 1993. Loßberg, Bernhard von. Im Wehrmachtführungsstab: Bericht eines Generalstabsoffiziers. H.H. Nölke Verlag, Hamburg, Germany, 1949 (second edition, May 1950). Ultimately promoted to the rank of General der Artillerie, Walter Warlimont continued to serve as Deputy Chief of the Armed Forces Operations Staff until September 1944 when he went on sick leave following injuries received during the 20 July 1944 assassination attempt on Adolf Hitler. Under the direct charge of Generaloberst Wilhelm Keitel, the Chief of the Armed Forces High Command, and supervised by Generalmajor Alfred Jodl, Oberst Walter Warlimont headed the “Weserübung” planning staff. The staff was originally composed of three service-specific groups headed by Kapitän zur See Theodor Krancke of the Kriegsmarine, Oberst Dr. Robert Knauss of the Luftwaffe, and Oberstleutnant Eyk von Tippelskirch of the Army. After being tapped to command “Weserübung,” General der Infanterie Nikolaus von Falkenhorst, the Commanding General of the XXI Army Corps (designated Army Group XXI for the operation), joined the planning staff along with his chief of staff, Oberst Erich Buschenhagen, and a few other select members of his corps staff. 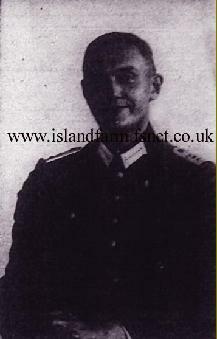 Note: Achieving the rank of Admiral, Theodor Krancke was held for a time as a prisoner of war at Island Farm Special Camp 11 after the war. For further reading on Generalmajor Bernhard von Loßberg during this period, refer to the excellent memoir Soldat: Reflections of a German Soldier, 1936-1949 by Siegfried Knappe with Ted Brusaw. Major Knappe served as Generalmajor von Loßberg’s Operations Officer (Ia) from February-March 1945. Knappe retained this position in the General Staff of the LVI Panzer Corps and passed into Russian captivity when General der Artillerie Weidling surrendered Berlin on 2 May 1945.